It’s a stand in Eately devoted entirely to the hazelnut chocolate spread that most of us dream of having each and every day. Stop drooling on your computer keyboard and go get yourself a flaky, buttery, Nutella-filled treat! 2. Chloe’s Soft Serve Fruit Co. Mom always encouraged you to eat your fruits, and since this soft serve is made of entirely fruit and water, we say it counts as part of your daily serving! All of the satisfaction with none of the typical dessert guilt. An addition to the French Bakery, Eric Kayser, Maison Kayser is a pastry oasis in Flatiron filled with gorgeous, delectable treats that are almost too beautiful to eat. Almost. A large bakery with an incredible selection of sweet and savory treats, Breads Bakery is best known for its babka. Get a frothy latte and sit to enjoy your warm chocolate babka, because once you start eating it, we place bets that you won’t be able to stop. While its rich hot chocolate and homemade marshmallows should be enough to satisfy your sweet tooth for the day, you can’t miss out on one of City Bakery’s Pretzel Croissants. Pro Tip: dip the croissant in your hot chocolate to balance out the sweetness! Spot Dessert Bar fuses together Asian and American flavors to create the perfect, harmonious dessert dishes. Order yourself a Matcha Tea Lava Cake to cure those Monday Blues! For all doughnut-related cravings, head straight to Dough Doughnuts. Why choose between Hibiscus, Dulce De Leche, or Salted Caramel when you can have it all? As long as we’re talking doughnuts, head to Daily Provisions on 19th Street and prepare to have the best Cruller you’ve ever had in your life. We’re actually not exaggerating. If you have never had Momofuku Milk Bar’s Cereal Milk ice cream, you are MISSING OUT. It is one of the most unique ice cream flavors you will ever try. And while you’re at it, grab a Compost Cookie and a slice of Crack Pie, they will change your life in the best way possible. With light and fluffy shaved ice flavors such as Yeti Tracks, NY Cheesecake, Sweet Milk and Roasted Black Sesame, there are unlimited flavor combinations to play with at Snowdays. If that’s too overwhelming, they have preset combinations you can choose. Just make sure to top it all with condensed milk! 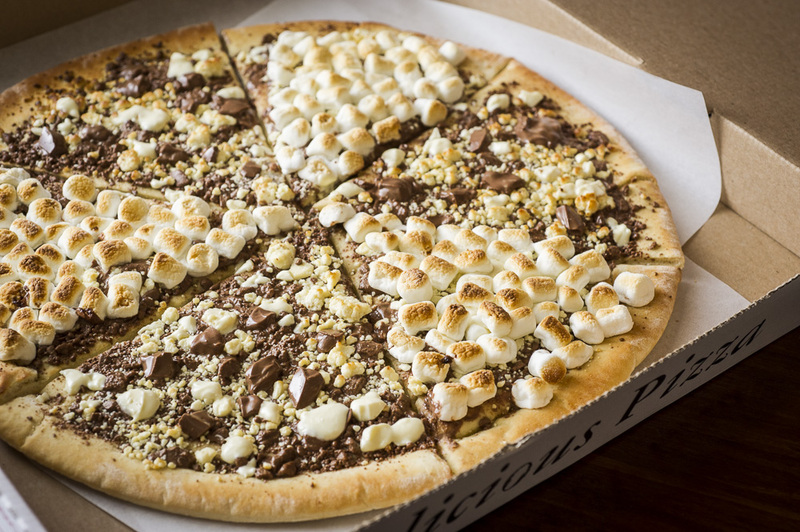 Probably the closest you can get to Wonka’s Chocolate Factory in NYC, Max Brenner offers playful options such as Dessert Pizza and a trifecta order of milkshakes. Built your own fondue plate or dip fresh churros in melted milk chocolate; the chocolate world is yours! If you’re missing Paris nights and sweet macarons, look no further. This quaint cafe offers traditional macarons in not-so-traditional flavors such as champagne and fig. So snag a box and nibble in Madison Square Park when it’s just beautiful enough to imagine you’re back in Europe! For tremendous flavor on a pint-sized scale, take a stroll to Doughnut Plant. Their donuts are delicious, and they are just small enough to make you believe that eating 5 of each flavor really isn’t that bad. If you have tiny treats on the brain, why not add mini cupcakes to the mix? Perfect for birthday presents, anniversary gifts, or even a reminder of how wonderful you are, Baked by Melissa is the ideal bite-sized sweet you need to make a great day even better! While Lady M Cake Boutique is known for its bright green Matcha Cream Cake, each indulgent item in this specialized cake restaurant is painstakingly handcrafted and worth every penny. Their Japanese cakes are piled high with layers of crepe and cream, and you’ll leave already wanting to come back. Lara Gould is the Community Manager at our Bond Flatiron location. Lara made the move from North Carolina to New York immediately after high school, attending Syracuse University and graduating in 2015 with a major in Public Relations and minor in Psychology. With a passion for engaging with people, Lara took her interpersonal skills to the entertainment world where she spent time in reality television casting and production. After a couple years, she transitioned to Bond Collective, bringing her collaborative and outgoing nature to the Bond Flatiron community.